Adult Tricycles: Are You Ready to go for a Ride? Are you keen to get back on a bike, but a little unsure of yourself on two wheels? Does a medical issue such as knee surgery or a disability prevent you from riding a bike – and even lifting your leg up over the bars to get on the seat? 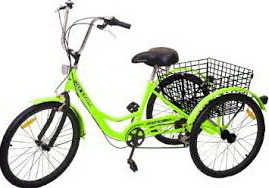 Whatever your reason for not riding a bike anymore, you may find you have a much easier time with one of the best adult tricycles on the market today. A 3 wheel bike like the Komodo Cycling 6-speed adult tricycle can make getting out and about a lot of fun – and they offer more stability than a regular bike. We've been taking a look at some of the most popular rides available right now, and have found a few that we think you'll like. Each is sturdy, easy to step over and accessible, whether you're unable to ride a bike or just want something a bit different. Have you Seen Komodo Cycling's 6 Speed Adult Tricycle? The Komodo comes in fun colours and features a low step through that makes it easy to get on and off. 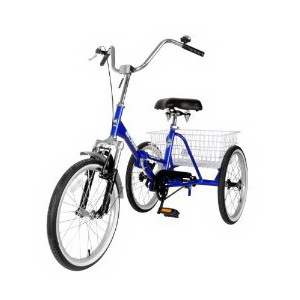 It also has a few fun and stylish add-ons, like fenders, a wire basket and a bell. However, Komodo backs this ride up with a reliable Shimano RS45 shifter and a Shimano TY-21 derailleur. 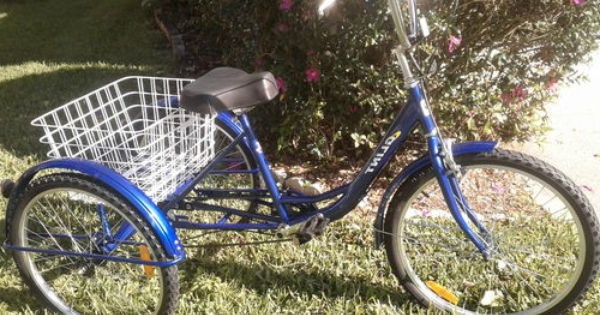 It's not the cheapest on the market, but it is a sturdy trike with plenty to love about it. Or the Kent Adult Westport Folding Model? With all the benefits of other folding trikes, Kent's version is ideal for new riders or those who haven't ridden in years. Thanks to its strong steel frame, it's very stable and easy to maneuver. With a handy folding mechanism, the Kent can be collapsed to take up a little space in your garage, although it's not as compact as a folding bike meant for commuters. Riders have especially praised its wide, comfortable seat and adjustable handlebars. How About the Mantis Tri-Rad? If you're after a totally comfortable, worry free ride, the Mantis might be the answer. Easy to ride for those who just want to cruise around the park or up to the farmer's market, it's worth noting that this model doesn't go very fast. Hence, it only comes with two front brakes! It's worth noting, if you're especially tall, that this model is only available in a 16-inch size. Depending on how you want to ride. As rugged and sturdy as it is, the Worksman models are still available at affordable prices. For American readers, the Trifecta trike is pretty easy to pick up – it's widely available at the major retailer, Walmart. The Trifecta's features include 20 inch wheels, a unisex frame, both a front caliper brake and a rear coaster brake, a 3 speed thumb shifter an a quick-folding frame. Sturdy and practical, it's benefited from many positive reviews from happy customers. Made of high tensile steel with steel forks and alloy rims, the Viking has a 16.5 inch frame, Shimano rear derailleur and 6 speed Revo twist shifters. It also has both front alloy V brakes and rear drum brakes, making stopping a breeze. Incredibly strong, it's great for anyone who's a bit wobbly on 2 wheels. The only factor to keep in mind is that it can lean or top slightly if you make a sharp, sudden turn. With so many options available, anyone looking to get out on 3 wheels instead of 2 is spoiled for choice. So what are you waiting for? If you're not able to ride a bike, there's no reason you can't get out on 3 wheels and have just as much fun!